Mr. Wackerman was the guest of honor at this year’s founders day event. He shared a few words on his early days teaching music in Seal Beach. In 1957, after graduating from college, I was looking for a teaching position, and most of the openings were at least a hundred to two hundred miles away. I really did not want to leave Southern California, so I decided to start working on my Master’s program. A couple of weeks before school was to start, I received a call from Mr. Dressler, the Superintendent of Seal Beach schools. He said they had a temporary music position open for about three months because their music teacher, Irene McCandless, was having surgery. She had general music classes all day, which mainly consisted of singing. I told Mr. Dressler I knew only basic piano, and he said that was okay because Mrs. McCandless just played simple piano parts. So I took the job thinking, “I can get by for three months.” I plucked out the piano parts with one hand, brought in recordings, and, when I knew they were getting bored, I brought in a drum set and was able to regain their attention. When Irene came back, I walked into her classes, and she was all over the piano. She was an amazing player. No wonder the kids got bored with my one hand piano playing! I also found out I had to do a Christmas musical, which had piano accompaniment. Luckily, I had an amazing sixth grader who played piano. His name was Kurt Perron. He saved the day. The district decided they wanted to expand the instrumental program, and I was given a permanent position. Irene McCandless had been a music teacher in Seal Beach for many years, and her students loved her. She was a wonderful person and was a tremendous help to me when I started teaching. I was at McGaugh School for 24 years until Seal Beach district was annexed to the Los Alamitos School District in 1984. 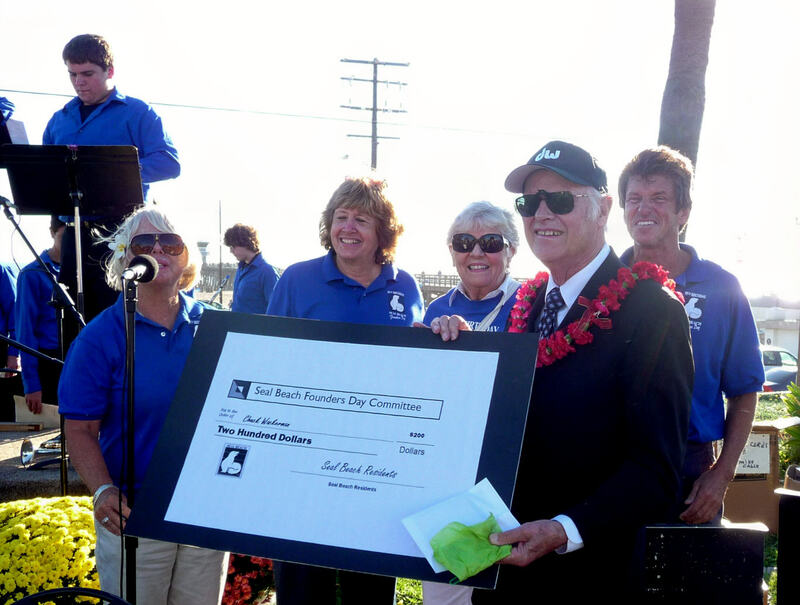 Many of my friends changed districts quite often, but I had no desire to change because the Seal Beach and Los Alamitos School District always supported music and felt it was an important part of the student’s education. They still do. There was no reason to look for something better because there wasn’t anything better — Great administrators, great colleagues, great parents, and especially great students, as well as a very supportive community. I want to thank Mr. Rush for bringing the Los Alamitos High School Jazz Band #1 today, and Richie Sebastian for bringing the Los Alamitos High School Marching Band, as well as my former students who are members of Seal Beach Jazz Trio. They were all certainly great. I am so happy that my wife, sons, daughter-in-laws, and grandchildren are able to be here today. Chad is unable to be here because he is touring in Europe, but his wife Naomi, my daughter-in law, and my grandchildren, James and Sophia, are here. Bob and Melissa, and my granddaughters, Madison and Mallory, are here also. John and Linda, who drove all the way down from Las Vegas, are also here. Brooks and Kelly, and the twins, who you’ve seen walking around, Cash and Miles, are here as well. My wife of 52 years, Barbara, who has helped me in a million ways over the years, is also present. I feel so flattered to be honored today, and want to express a very heartfelt thank you to the Founder’s committee. Thank you very much. I would also like thank Libby Appelgate for the nice article that was in the Sun newspaper, and Roxanne Kopetman and Ana Venegas who did the Register article and pictures. Thank you. I really appreciate everyone coming today. It is great to see students, parents and friends, some of whom I haven’t seen in years. I would also like to thank our Superintendent, Sherry Croft, for attending. Our esteemed principal at McAuliffe Middle School, Mr. Dennis Sackett, has a plaque in his office that says, “Another Day in Paradise.” Because of everyone here today, my teaching career is another day in paradise every day of the year. Thank you. Be sure to check back during the week for more photos and videos from the concert. There will also be some new historical photos and articles posted during October.